Strong updraft on storm as we approached from the west. Notice the lowered base on the bottom left of the photo. Tornado near Canton, OK. Actually was stalled out and appeared to be coming back at us down the road at this point! Zoomed out view of the tornado as it crosses Hwy 58A. Another view of the tornado and violently rotating mesocyclone. Violent tornado starting to grow in size! Large cone tornado starting to become extremely violent. Incredible tornado moving to our north-northeast. Very large cone tornado at this point, and also notice the satellite funnel! Beautiful rope tornado near Fairview, OK.
Another view of the tornado near Fairview, OK as we watched on Hwy 58, looking northwest. Tornado starting to weaken and rope out at this point. 05-24-11 CHASE LOG: OKLAHOMA This log details our chase during a High Risk for severe weather with a whopping 45% hatched area for tornadoes! What will later be known as the May 24th Tornado Outbreak. The set-up featured a vigorous upper trough and shortwave ejecting out of the Rockies and becoming negatively tilted in the Southern Plains by the evening. At the surface, an area of low pressure was rapidly deepening through the day and sliding north from the Texas Panhandle into western Kansas, along with an associated warm front. A strong dryline extended south of the low and was forecast to advance through Oklahoma during the day, igniting storms in the rich moisture of upper 60’s and lower 70’s dewpoints with an extremely unstable airmass as MLCAPE values reached 4000-4500 J/KG. With strong south to southeast surface winds gusting 20-30 mph and 6 km winds strengthening to 90 kts by early evening, as well as strong turning with height, the wind shear was incredible as depicted already by the morning sounding out of Norman, OK (shown below). There were going to be two separate areas to target and I had to make a decision to either go north into KS, ahead of the surface low and play the triple point, or even the warm front that had been enhanced by a morning outflow boundary, or play the dryline further south in the highly unstable and sheared airmass. The decision was made to stay in Enid, OK and wait for initiation along the dryline as it appeared to be sure bet for storms to produce tornadoes, some strong and possibly long-track. Note: The northern target also ended up producing many tornadoes across central and western KS. Shortly before storms fired, we moved south on Hwy 81 to Kingfisher and then west on Hwy 33 as storms began to fire on the dryline. The first storm that started to look extremely strong with echo tops approaching 50k feet plus was near the Independence/Putnam, OK area. We circled around the storm, staying on Hwy 33 to Hwy 47 west and then north on Hwy 183 to cut the storm off going east on Hwy 51. The entire time we could see a lowering and then rotating wall cloud begin to form, the first signs that this storm was about to drop a tornado. 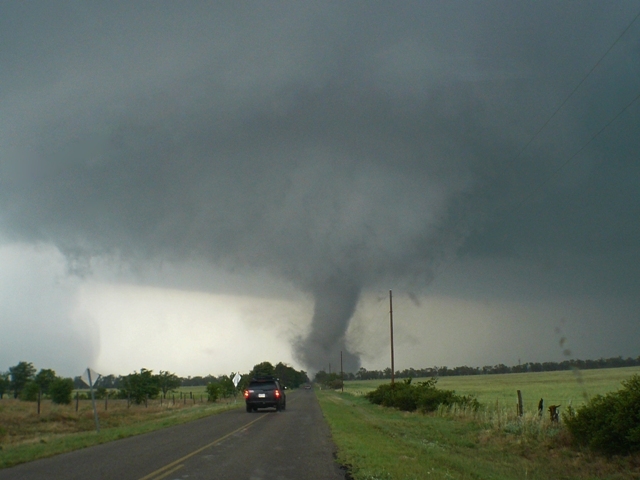 Near the town of Canton, OK it produced a strong tornado that was later rated an EF3, producing winds of 136-165 mph. The damage path from this tornado spread 9 miles in length with a maximum width of ½ mile! 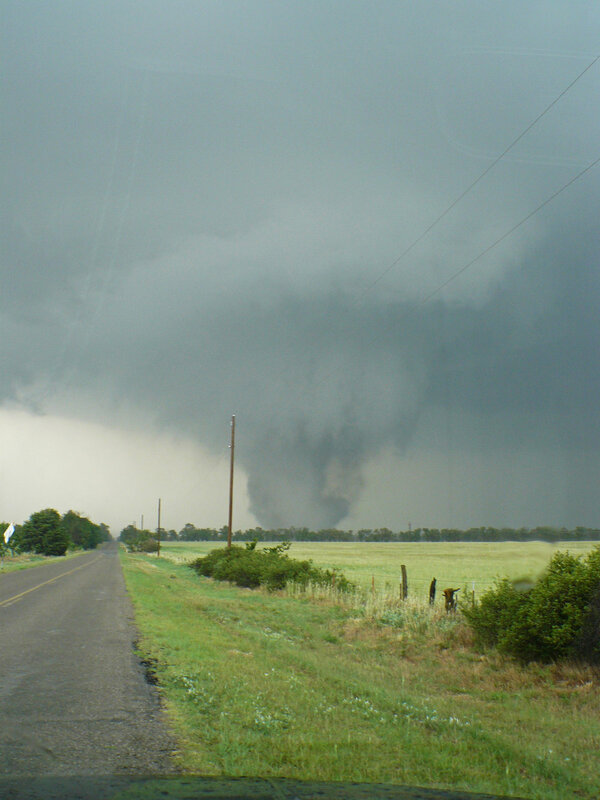 We were able to get within ¼ - ½ mile of this tornado and witnessed first-hand the tornado inception and a substantial increase in size as the tornado moved to our north-northeast. We ended up following on Hwy 58, seeing another short-lived tornado in the vicinity of Longdale, OK. Continuing to follow the storm, we saw our third tornado of the day, a beautiful, long, rope tornado near Fairview, OK. Thereafter, the storm weakened as other storms began to interfere with it and disrupt the storms inflow. 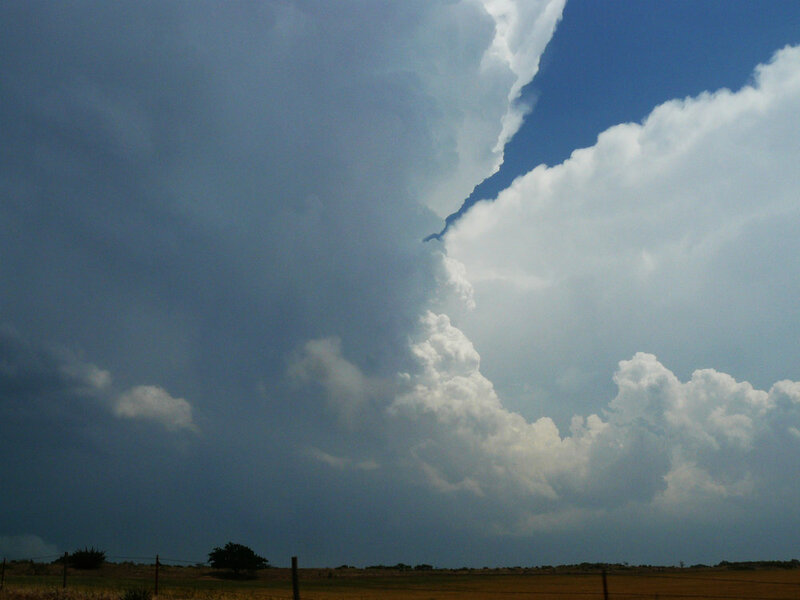 We decided to get ahead of the storms as numerous tornadic supercells were developing further south along the dryline and were quickly advancing east. Our path took us to Stillwater, OK where a tornado warned storm advanced upon the city. Apparently there were power flashes in the city at the time we saw the storm move through but we could not see if there was indeed a tornado as the storm was completely high precipitation and any tornado would have been rain-wrapped. MaryLynn and I stayed ahead of the storms till near Tulsa, OK before calling off the chase as it was becoming too dangerous to continue at that point. Not a bad day with 3 tornadoes on the first storm we came upon! Unfortunately, there were many other strong tornadoes across the state that did some major damage and sadly there were fatalities from this outbreak.